I'm probably more unceremonious than most Christians, but teaching my children about the Christian faith has always been important to me. In some areas of life, I promote individuality and differing points-of-view with my children. However, I can't help but hope and promote my view of my faith with them. I've done this for several years, with one teaching tool being kids' books that are Christian-based. My Great Big God is a good resource for children who are learning about stories of the Bible. This hardback book has twenty short stories, and each one is told in rhyme. I think that the way the stories are written and that they're not too long are favorable points in keeping your child's attention while reading this book. Cute illustrations depict each account. Each story has a scriptural reference so you can look in the Bible to read the entire story. 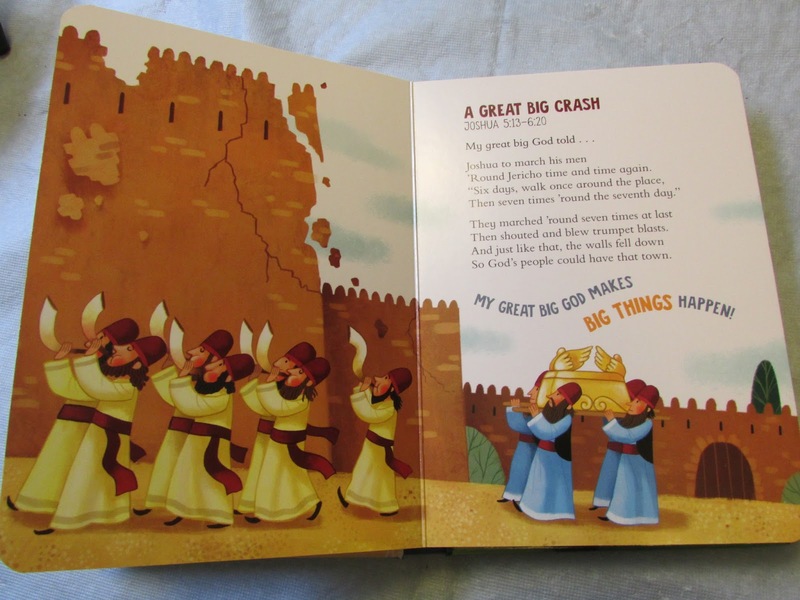 Throughout this book, children will learn that "My Great Big God" saves the day, guides me, makes big things happen, and forgives. One person will win a My Great Big God children's book. I am thankful for my family. Family means everything to me. We all love each other. I am thankful for our health & my family. I am always thankful that my children are so understanding and strong; being a single mother is difficult but, we rise to the occasion together. I am thankful for family and friends and my pets! I am thankful for my kids, my job, and Friday night game night! I'm thankful for my grandchildren. I am thankful every day for my children and getting to watch them grow in to young amazing people. Good Luck everyone! Looks like a great book! I'm thankful for my 3 sons and my 3 granddaughters.. Think my grandchildren would love this book. I'm thankful to still have both my parents. I'm thankful for this pregnancy! I am thankful for the responsible way our kids turned out and the nmorals they are raising their kids (our wonderful grandkids!). I am thankful for so many things: family, health, home, job, friends, church, and the list goes on. I am truly blessed! I'm thankful for people who care for me when I feel sick and send well wishes! I'm Thankful for my family and having food, shelter, water, electricity...the list goes on and on! Thank you God! I am thankful for my children and our health. I am thankful for my home and food and general safety. I am thankful for my family and their overall health and happiness. I am thankful for everything the Lord has given me. My husband, my son, my family, they are all huge blessings. I am thankful for His sacrifice and for Him giving us a place to spend eternity with Him and our loved ones. Romans chapter 10 verse 9 "that if you confess with your mouth the Lord Jesus and believe in your heart that God has raised Him from the dead, you will be saved." I'm thankful for every day I live in good health. I am thankful to serve an amazing God! !